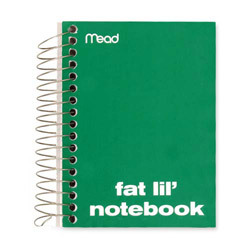 Fat Lil Wirebound Notebook offers a compact size for easy note-taking on the go. Contains 200 sheets of college-ruled, white paper. Each sheet is perforated for easy removal. Wirebound notebook has a cardboard cover to protect your notes. Assorted Ruled and Subject Notebooks from Mead! 910 In Stock today.